NAL offers container and break-bulk service to Russia, the Baltics, Black Sea/E. Med., Africa, the Mid-East, Central and South America. "We go where your cargo goes"
Network America Lines is a NVOCC and Freight Forwarder established in 1998 by R. Kenneth Johns, former president of Sea-Land Service, the company which pioneered containerization. NAL specializes in shipments with Russia, the Baltics, and the Black Sea/E. Mediterranean. It also provides service with Africa, the Mid-East, Central and South America, as well as Asia and Oceana. 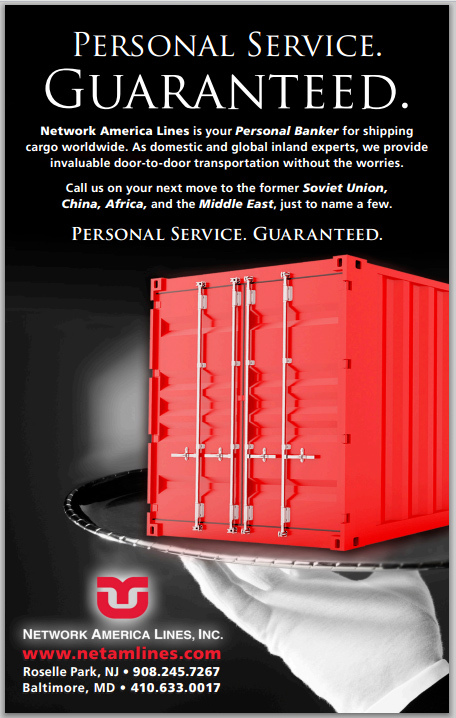 NAL has a dedicated staff with years of experience in all aspects of the shipping industry. It utilizes its agency relationships worldwide. The NAL Team, Customers and Friends at Yankee Stadium.